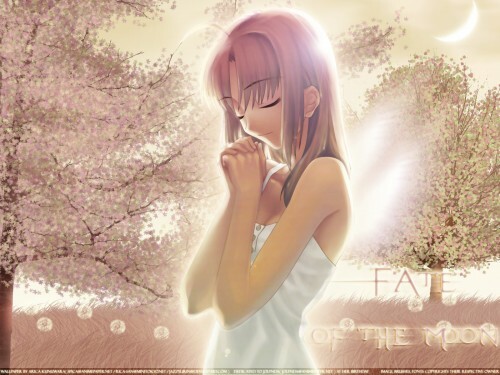 Fate/stay night Wallpaper: . :*Fate of the Moon*:. Minitokyo »	Fate/stay night Wallpapers » Fate/stay night Wallpaper: . :*Fate of the Moon*:. This is a b-day gift for my dear friend, Jolynda! Her b-day is on 10 March that is tomorrow(or maybe today)~! Time: 8 hours I think..
Well, I hope you guys like it, ESPECIALLY YOU, LYNDA-PYON! Please full view & leave a comment! Best wall I've seen in a while. Nice job! Such a calm and peaceful wall ^^ I like her pose and how you made the background because it really matches very well! Awesome skills you have! Keep it up! Yet another great wallie! Yay! *Fav* Yay! Happy day! A good start. Your color choices complement the subject well. I did find a couple areas that you might consider revising in the future. 1) The text: I think the size and style don't fit into the composition of your scene. 2) The trees: The left looks like too muddled by the translucency and low contrast between the leaves. The right-hand tree looks much more substantial by comparison. Wow, haven't seen such a good wall for weeks. Great one. I like the lighting and the background. It's a great wallpaper! Whoa, the effect is awesome! Damn, Sakura may not be one of my favored characers, but this is an exceptional wall. lovely effects. Wow, it's Saber?! 0.o w0w, she looks FACINATING(Because of you saying facinating3x, I began to say it to!)! The wall is very calm & peacefull, the color shceme is also fantastic. Calm & peacefull. Awsome job! Definately +fav! Keep it up, Ricachet! Awesome work. The background is great and Saber looks really good in this scan. It is drawn very attractively. wow I like what you've done with the original scan, nice work!